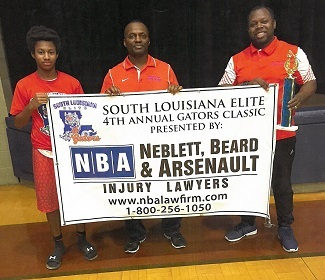 For the third year, Neblett, Beard & Arsenault has sponsored the South Louisiana Elite Boys Basketball Team in both their regular season and the 2018 Gators Classic Tournament. 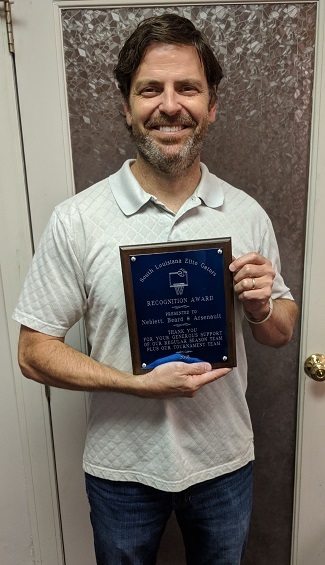 Their mission is to promote positive character, encourage academic excellence in school, teach appropriate behavior and commitment to team play and sportsmanship, and to provide an environment for sharpening individual basketball skills and playing abilities. In appreciation of the firm’s support, the team sent us a Recognition Award, along with a picture of the coaches holding the NBA banner. Said the coach, “We thank Neblett, Beard & Arsenault for being a generous sponsor of our AAU basketball organization. With their support we were able to pay for some of the operating expenses, such as gym rentals and lodging.” The firm proudly supports local athletic teams like South Louisiana Elite, and wishes them the best of luck in their upcoming season. To learn more about their team, click here.